Carbonless or NCR (no carbon required) or Carbon copy forms are an essential part of any business. Our carbonless form printing enables effortless transactions for staff in transport, hotel, and insurance companies. We also offer features that customize the carbonless forms according to your brand. What Are the Different Sets Available for Business Forms? 2-Part Set contains a yellow form as the extra copy. 3-Part Set gives you two more copies of the original document on a yellow and a pink form. 4-Part Set provides three more copies of the white form on yellow, pink, and gold forms. How Can I Customize My Carbonless Forms? Use these features to distinguish your custom carbonless forms. Keep things on track with sequential numbering. Adding this feature helps streamline records for data monitoring and record keeping. You can place up to 5 digits. A glued edge determines how the set will unfold. We apply clear glue on any of the following edges on the form: top, left, right, and bottom. This keeps all the copies together for quick reference and tearing out. Combine multiple sets with our padding options. Without the padding option, sets will arrive separated from one another. Padding glues together 25 to 50 sets in one pad either with a cardboard back or wrap-around cover (your choice). The cardboard back uses a chipboard to support several sets glued together. The backing lets you flip through the sets and provides support for the entire pad. The wrap-around cover, as its name indicates, wraps around from the back to the front of the pad. You can also place the cover between sets to prevent marking from separate forms. Get in touch with us today and make the most out of our carbonless form printing services. Use our available templates to start customizing your own NCR form. You can also upload a file on our online calculator. Be sure to select our free file check offer so you can review everything before printing. What is carbonless paper and how does it work? Carbonless forms are also known as no carbon required (NCR) forms. Without the use of carbon paper, they make duplicate copies of a handwritten or type document. Microcapsules of ink in each sheet transfer the original imprint. Why should I print customized carbonless forms? 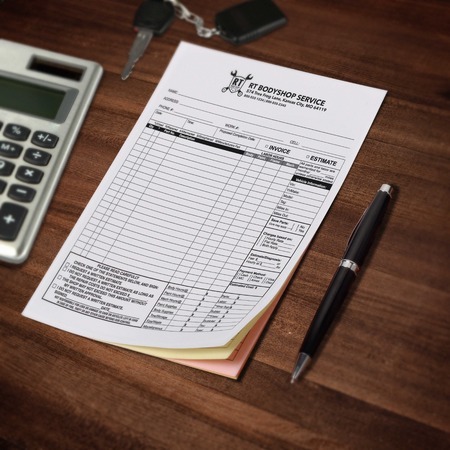 A customized carbonless form gives customers a professional impression of your business. The business forms you hand out are less likely to appear generic and like other companies. When can I expect my carbonless forms to arrive? On our online calculator, you can select your preferred printing time. Expect your order to be ready in 4 business days. The printing time does not include shipping to your address. Select the “Estimate Shipping Cost and Delivery Date” link to find out your order's arrival. How many pads do I get based on the number of sets ordered? On our online calculator, you can specify the number of sets and the set quantity per pad. Dividing the number of sets by the number of sets per pad gives you the total amount of pads. For example, if you choose 250 sets and 25 sets per pad, that will yield 10 pads. If you select 2500 sets and 50 sets per pad, you'll end up with 50 pads.